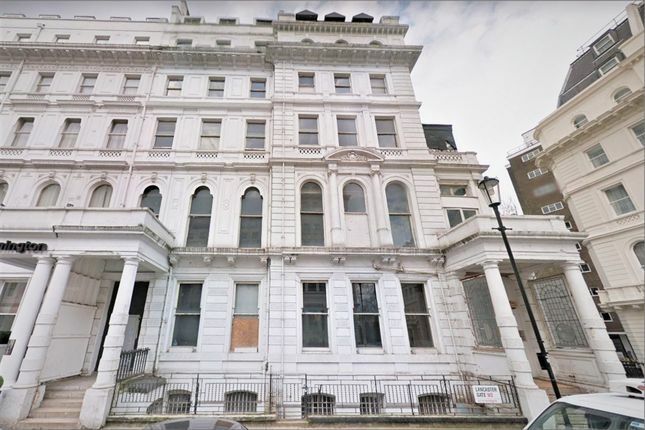 Paddington Estates are instructed to sell this freehold site containing two white stucco fronted seven-storey Grade II listed buildings, located within the Bayswater Conservation Area. This unique development opportunity comprises of 25,000 SqFt with views over Hyde Park. The building would be suitable for a hotel or residential development, subject to the necessary consents. Planning permission for conversion to 10 luxury apartments was recently withdrawn but can be resubmitted on the same basis. Nearby, 'The Lancasters' development sold out at upto £3,500 Per Square Foot. Should this prime trophy property achieve £2,500 Per square Foot, it would offer a Gross Development Value of £62.5M. Property descriptions and related information displayed on this page, with the exclusion of Running Costs data, are marketing materials provided by Paddington Estates, and do not constitute property particulars. Please contact Paddington Estates for full details and further information. The Running Costs data displayed on this page are provided by PrimeLocation to give an indication of potential running costs based on various data sources. PrimeLocation does not warrant or accept any responsibility for the accuracy or completeness of the property descriptions, related information or Running Costs data provided here.